Whoever can control and monopolise our seeds, can hold the food and agricultural system of the country and the world in their hands. “Science” has become an important tool in pushing for acceptance of GMOs among the general public and political decision-makers. In this field, science is becoming corporate science. There are many examples of the use of science for the benefit of corporations both in Thailand and across the world. 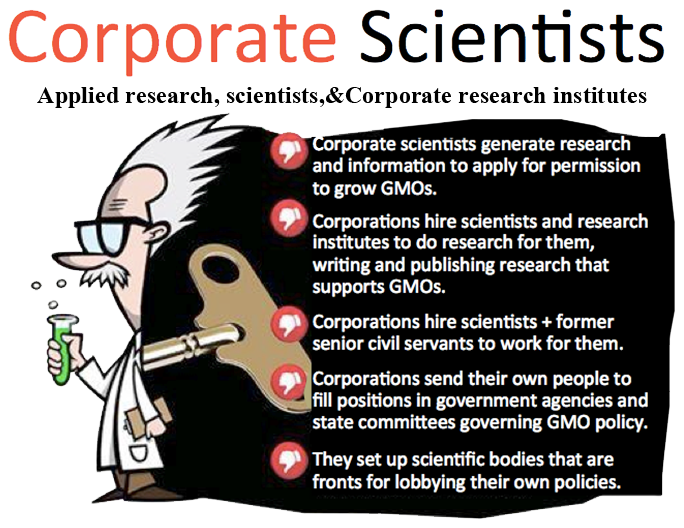 1) Corporate research has been used to apply for permits to cultivate GMOs. Normally, GMOs such as plants that produce the BT toxin or plants that are herbicide resistant, will not be authorised until test results can show that there are no impacts for health or the environment. Assessment reports in most cases, or in almost all cases, are written by corporations. Corporations block independent scientists from using their patented GMOs for carrying out independent tests on yields and impacts (http://www.scientificamerican.com/article.cfm?id=do-seed-companies-contr...). 2) Corporations hire or financially support scientists and academics and even entire scientific research institutions, and publish work that supports their interests. the Monsanto Corporation has provided financial supported to Naresuan University to prepare for the testing of GM maize NK603. Previously it supported the Department of Agriculture to carry out tests on BT cotton. These pieces of research have been claimed as national research for the development of biotechnology, but in reality these are simply pieces of research which the companies can use in submitting applications for the cultivation of the above GM crops in Thailand. CropLife Asia, an organisation set up by corporations such as Monsanto, DuPont, Syngenta, are behind the provision of information and support for the publication of a book entitled “A decade of GM crops in Europe: fears and facts”. The information contained therein was supplied almost entirely by the corporations. Companies have supported senior economists at a certain university to write an article supporting the benefits of growing BT cotton in Thailand (there are those who refused to write this article, despite knowing they would be very highly remunerated, since they believe that writing such an article promoting companies profits would not be the proper thing to do). Academics who have been involved in drawing up the biosafety policy of the Department of Agriculture, civil servants from the Office of Policy and Planning of the Ministry of Agriculture and Cooperatives, who are very close to Ministerial executives (from Agriculture and Cooperatives as well as from the Science Ministry) have become company officers whose main duty is to use their personal relationships to lobby for Thailand to authorise the cultivation of GM crops. This is very similar to the Charoen Pokphand company hiring the former Director General of the Department of Agriculture, the Permanent Private Secretary of the Ministry of Agriculture and other senior officials to facilitate their work. For example, they have supported the establishment of the International Service for the Acquisition of Agri-biotech Applications (ISAAA), which is an organisation aimed at disseminating statistical information and the benefits of GMOs. This has made presentations that disseminate selective or even distorted information that is biased towards the interests of the corporations (https://www.foeeurope.org/press/2009/Feb10_Biotech_indsutry_fakes_growth...). In Thailand, Biotech Associations have been set up to send corporate staff or selected individuals which support the interests of the corporations to perform duties in various state committees. They have supported scientists, journalists (in particular, the agricultural media), and farmers to participate in study visits to other countries and held trainings on subjects promoting GMOs. These actions by corporations are turning science, which should be the basis from which we search for truth and develop technology that will benefit the public, into “science for the benefit of corporations”.